Average Weight	: 65 - 85 lbs. The name "Beauceron" is actually a misnomer: the breed doesn't come from the historical region of Beauce, but from the region of Brie. But as the name "Briard" was already taken by another breed, the misleading name "Beauceron" was applied to the herding dogs in 1898. Beaucerons were used as messenger dogs during the World Wars--and they were also used, tragically, as a device for finding land mines in the field. But this ill treatment is hardly the norm for Beaucerons--and the fact that the Beaucerons were willing to march into minefields for their beloved humans gives some compelling evidence for their noble, admirable character. 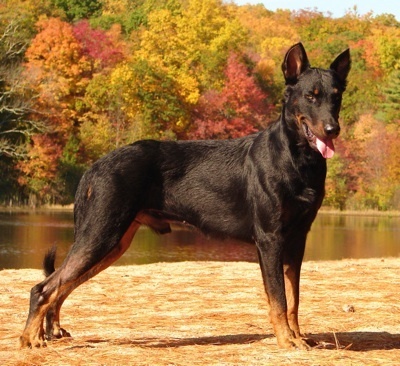 The Beauceron is rare in the United States. In 1863 a man named Pierre Megnin differentiated two types of sheepdogs, one with a long coat, which became known as the Briard, and the other with a short coat, which became the Beauceron. In 1863 the Beauceron was shown in the first Canine Exposition in Paris. In 1897 the first shepherd dog club was founded and both the Beauceron and the Briard were accepted into it. Prior to 1889 the Beauceron and Briard had a reputation of being a flock guard who was brave but one who was more incline to snap and bite in defense of its flock. This is one breed that is very versatile, and excels in Herding, Protection, Agility, Obedience, Drafting, Schutzhund, Tracking as a Service Dog, Police K9, Flyball and Agility! WOW! The Beauceron is one of France's most ancient and most beloved dogs, with a history dating back as far as the sixteenth century and a crucial role in some of the greatest conflicts of the twentieth century--as well as a peaceful yet no less crucial role in peaceful matters of everyday rural life. Beaucerons bear a passing resemblance to German Shepherds--part of their value as watchdogs depends on exactly this fairly large, threatening appearance. Considering the strong resemblance, it's surprising that the Beauceron is one of the major purebred dogs of the world--the breed developed exclusively in France, with no known cross-breeding occuring between the Beauceron and dogs of foreign nations. It's this strange quality of purity that gives the breed its special place in the French heart--not to mention the Beauceron's other qualities of loyalty, nobility, friendliness, and undeniable energy for herding and working. Beaucerons are nearly as proud of themselves as their owners are of them. They are known for their combination of reserve and frankness when meeting strangers, and are not known for overly aggressive barking or violence when confronting the unknown. They're also known for their strong leadership abilities within the animal kingdom--a necessary quality when herding large numbers of sheep or warding off predators, and one which gives the Beauceron a great deal of its noble bearing. The problem with this noble temperament, however, is this: the Beauceron is an incredibly noble, commanding dog, and he or she always knows it. If you, as the owner, don't know it--and don't show it--the Beauceron has a tendency to assume that he or she is at a higher place in the pack hierarchy than you--and to act accordingly. This can lead to aggressive behavior, destructive activities, or simply a lack of respect and an inability to properly train the breed. This leadership ability and reserve makes the Beauceron ideal as a watchdog simply because it "splits the difference" between the faults of smaller, aggressive terriers and the faults of larger, more sedate retriever-type dogs. Beaucerons are a natural deterrent to dangerous individuals due to their menacing appearance and pure size, of course, but they also tend to regard strangers with openness rather than with terrified barking or jostling for territory. If strangers start to become openly hostile, of course--if they break into your home, if they threaten your family, if they appear to be highly suspicious or frightened--the Beauceron will take charge of the situation and defend his people with maximum ferocity. This is a useful quality, of course--but it also means that you need to be careful about raising your voice to any family members when a Beauceron is in the area, no matter how highly the dog might think of you. Beaucerons will work well with other animals and children--provided that the children learn fairly early on how to handle the Beauceron, and provided that the animals don't mind being pushed to a lower place within the animal hierarchy of your house. If children tease or harm the Beauceron, they will unlikely take well to them--and almost certain not to take orders from them, even when they get older and bigger. This can lead to serious discipline problems from your Beauceron, and should be avoided. If children are respectful yet firm with their Beauceron, however, the Beauceron can be an excellent companion and guardian, even for very young children. As Herding dogs, Beaucerons have few major Health Problems. Beaucerons present few problems as far as grooming goes. Beaucerons were bred as herding dogs--which means, above all, outdoor dogs. That means in turn that they're going to want to spend as much time outdoors as possible--and in order to build the strongest possible relationship with your dog, you'll want to spend time outdoors with them as well. Beaucerons are highly trainable dogs, and can be considered among the most impressive of dog breeds when well-trained: noble, imposing, helpful toward human beings, and with few problems related to discipline. The problem, however, is that few people actually know how to take full advantage of the Beauceron through training. Worse yet, many people think that a Beauceron can be trained with just a few hours of work every week, leaving the Beauceron completely alone in the house for the rest of the time. This will inevitably result in an untrained Beauceron--meaning a destructive, neurotic, and aggressive Beauceron--and will obliterate many of the qualities of nobility and gentleness that make the Beauceron so attractive as a breed in the first place. Despite the difficulty of training a Beauceron, it's vital to learn how to train the Beauceron yourself--and to devote a great deal of time to this training--if you think that this breed is ultimately for you. Hiring a professional trainer may result in a well-trained, obedient Beauceron, it's true--but that Beauceron will be well-trained and obedient when his or her trainer is around, and will be another kind of dog altogether when it's simply you in the drivers' seat. So if you're interested in owning a Beauceron, make sure that you're willing to learn how to train it--and make sure that you're willing to spend the time to train it effectively as well. One of the keys to successfully training a Beauceron is to train it early. This holds true for all dogs, of course--one of the easiest ways to ensure that a dog behaves in a desirable fashion is to ensure that desirable habits are formed before the dog has a chance to form less desirable habits--that he learns to chew his bone before he learns to chew your sofa, for example. But for the Beauceron, the early training policy isn't merely a good idea, it's absolutely vital--for the simple reason that the Beauceron, who can be a fairly cute puppy of only a few pounds, will inevitably grow into a massive, hundred-pound dog with powerful limbs and a powerful personality. And if you haven't taught the Beauceron how to curb that personality early on, all of that weight and power will be used--but not in a way that you'll enjoy, we guarantee. Once your training program has begun, remember to follow two rules: keep it up, and be consistent. The Beauceron's inherent nobility and arrogance makes it less likely to obey your commands at first, or to be interested in a training program. It's vital to gain the dog's respect through positive training messages and some light negative methods--probably limited to a harsh tone of voice to discourage negative behavior, consistently applied. Consistency is the key here: the Beauceron needs to know, from constant, repeated examples, exactly which behaviors are rewarded and which behaviors are punished. If the Beauceron perceives the slightest leeway in your policy--if, for example, you punish your dog whenever you see him chewing the furniture, but then leave him alone for twelve hours a day to chew the furniture unmolested--then the Beauceron won't perceive you with respect, won't follow your commands, and will gradually become more aggressive and hostile toward the human beings who, in the dog's mind, he or she rules over. Does this mean that a Beauceron can't be trained? Absolutely not--but be aware of the commitment it takes to effectively train a dog of this breed, be willing to take the time to train it, and be patient. If you can do all of these things, it's only a matter of time before you reap your noble reward.